My love for dogs began when I was very young…. I was always bringing home strays …fortunately my mother shared this love of animals. My training experience began with horses…I trained several from the “ground up”. When Steve and I were married we decided our family was not complete without a dog so we purchased our first purebred dog, a Golden Retriever named Brew. He taught me many things but unfortunately his life was cut short. Next came my first Belgian, Belle who was my first competition dog. 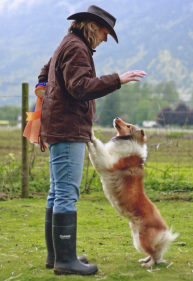 From there I got the bug and started competing not only in obedience but herding, agility and conformation. Kaos was next…. He was my first conformation champion as well as obedience champion. My highlight with him was High in Trial at the 2002 Tervuren nationals in the U.S. with 82 dogs competing. George was my first toy dog and it really has been an eye opener. His first time in the ring, George and I came home with a High in Trial. Although he earned his Canadian Championship, his Can and U.S. CD’s and his U.S. RA… and is a St. John’s Ambulance Therapy Dog, I was unable to continue training with him due to health concerns. Cleo aka FLEA, who has her Can Ch. One leg of her Open title and Rally Advanced titles also has health issues so her training too was cut short. Currently I am competing with a Sheltie, CH. OTCH. Fairfax Hot on Your Heels HAs HAd SDS RE Am CDX RN Asca RS-N “EMBER” was the TOP Versatility Sheltie in Canada 2010 and then the TOP VERSATILITY SHELTIE at the 2013 U.S. NATIONALS. She has just recently completed her Utility Title and has 11 Championship points towards her Herding Championship.